No-Fail Chocolate Chippers is a recipe adapted Bon Appetit. 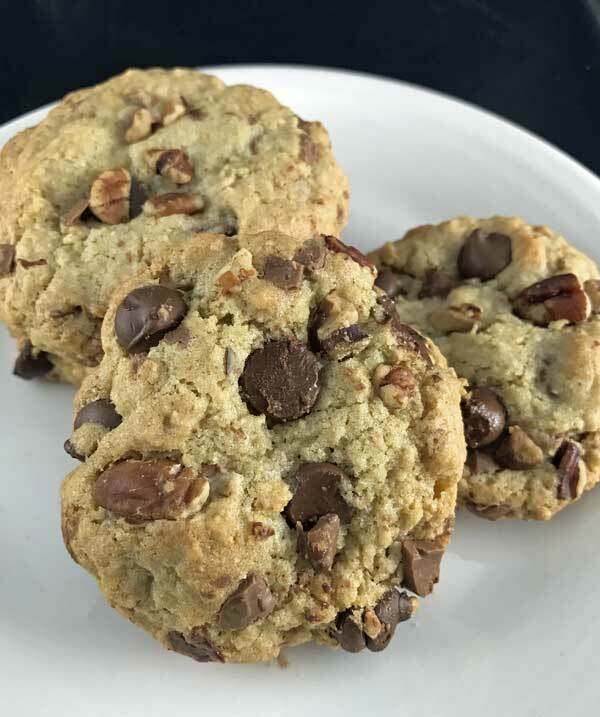 The version below is a half batch, and if you are familiar with the usual ratios of oatmeal and chocolate chip cookies, you can see that these have a smaller proportion of butter. The dough is dryer, but the cookies are actually really good and have a nice texture. To keep the dough from being too dry, make sure to measure the flour with a light hand or weigh it out. No Fail Oatmeal Chocolate Chippers are chocolate chip cookies made with ground oatmeal. The dough has less fat than most and over the years I've wondered if it was a typo in the recipe. However, I kind of like the version as is even with the lower than usual amount of butter. Grind oats in processor. Add flour, baking soda and salt and pulse to mix. Cream butter and both sugars in a medium bowl. Beat in egg and vanilla. Add flour mixture and stir until blended. Stir in walnuts and both types of chocolate. Using about 2 tablespoons of dough, form dough into balls and place on ungreased baking sheet. Flatten slightly. Bake until edges are golden brown, about 12 minutes. Cool on sheets 5 minutes. Transfer to racks; cool completely. Make sure to measure the flour with a very light hand or weigh it. If you use too much flour, the dough will be too dry. My post for tomorrow is something similar from Nestle: Chocolate Oatmeal Chippers. Ha. Great minds think alike!